Alderman William Leathem, Chairman of the Council's Development Committee visits new business Cool K9s, which was the 100th business to avail of the Go for It prgramme in the Lisburn area in recent months. Also pictured are Charlene Marshall, owner of Cool K9s; Molly the dog; and Martina Crawford from Lisburn Enterprise Organisation, which delivers the Go for It programme on behalf of the Council. Charlene Marshall recently took part in the ‘Go for It’ programme to create a business plan for her new business Cool K9s, a dog grooming business in Lisburn. 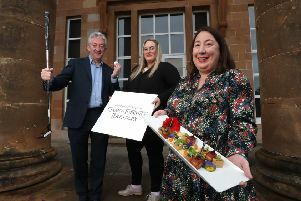 The well-known Go for It programme is the collective responsibility of all eleven councils with the contract being managed by Lisburn and Castlereagh City Council. Charlene added: “I was very pleased with the Go for It programme and found the advice given to be very beneficial in compiling my detailed business plan. As a professional dog groomer, who previously worked for a salary, it was very daunting to take the step to self-employment and I valued the support provided by LEO. To find out more about the Go For It programme. contact 0800 027 0639 or log on to the website www.goforitni.com.